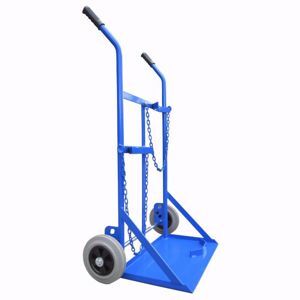 This Welding Trolley is designed to hold one G size oxygen cylinder and one G size acetylene cylinder and its ideal uses is for workshops, construction sites, mining. Brackets to locate bottles into position. Fully welded, mild steel construction with powdercoated finish. NS-GCN2 welding trolley has been designed to suit 1x type G Oxygen and 1x type G Acetylene gas cylinder set.